CorePower Yoga strives to increase awareness and widespread adoption of yoga by making yoga accessible to everyone, through a variety of yoga styles, for beginners and more advanced yoga students, and class times to meet any schedule. FREE week of unlimited yoga offer! Has coupon!! Dahn Yoga is a leader in health and wellness, offering classes in Yoga, Tai Chi, meditation and other mind body training programs based on Traditional Korean healing philosophy. Has coupon!! New Halau offering weekly hula classes for Keiki, Opio, Kane, and Wahine. Has coupon!! We provide superior injury prevention, rehabilitation, fitness and athletic performance services. Click on link to learn more and view coupon. Has coupon!! Jazzercise Classes In East Oahu (Kaimuki and Niu Valley). Jazzercise is a pulse-pounding, beat-pumping fitness program that gets you results�fast. It's a calorie-torching, hip swiveling, Shakira'd-be-proud dance party with a hot playlist to distract you from the burn. Has coupon!! Self Defense Classes. Classes focus on self defense, utilizing techniques from Chinese Kempo and Gracie Jiu-Jitsu, which Instructor Wong has trained since 1994. Has coupon!! The easy 1-2-3 Dance/Exercise MUVE inspires people to use music and movement to create health and happiness in their lives. It?s easy, forgiving and effective. Yoga Hawaii is one of Oahu's first yoga studios founded in 1999, and offering a diverse range of styles and levels of yoga classes to suit everyone in the community. Has coupon!! Debra is an Iyengar certified yoga teacher. 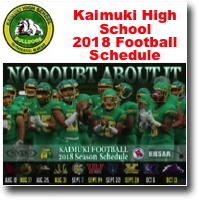 View/Download Kaimuki High School Football Schedule. Kaimuki High School provides a fun, safe, supportive, and interactive learning environment where all students can learn to rigorous standards, develop their individual talents and interests, and prepare for success in career, college, and life.